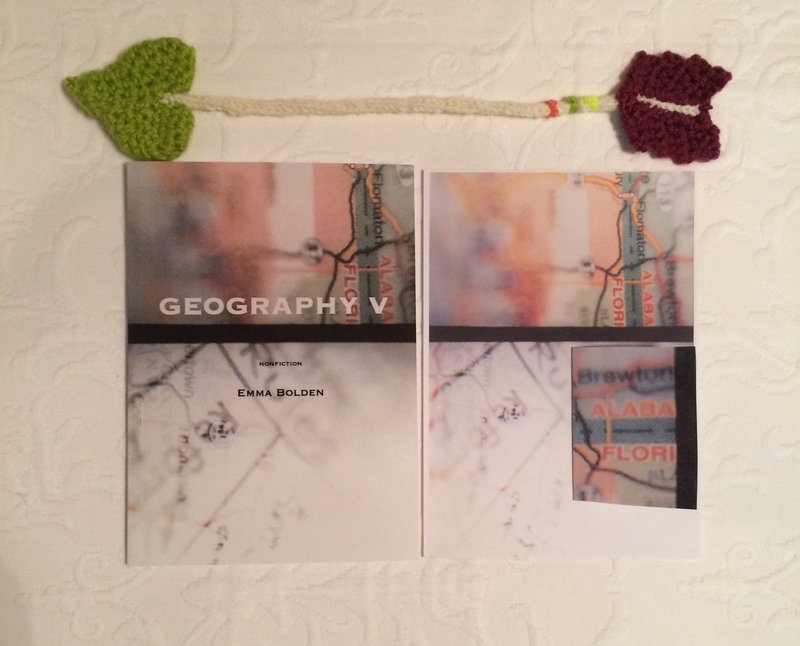 Want a signed copy of Geography V? 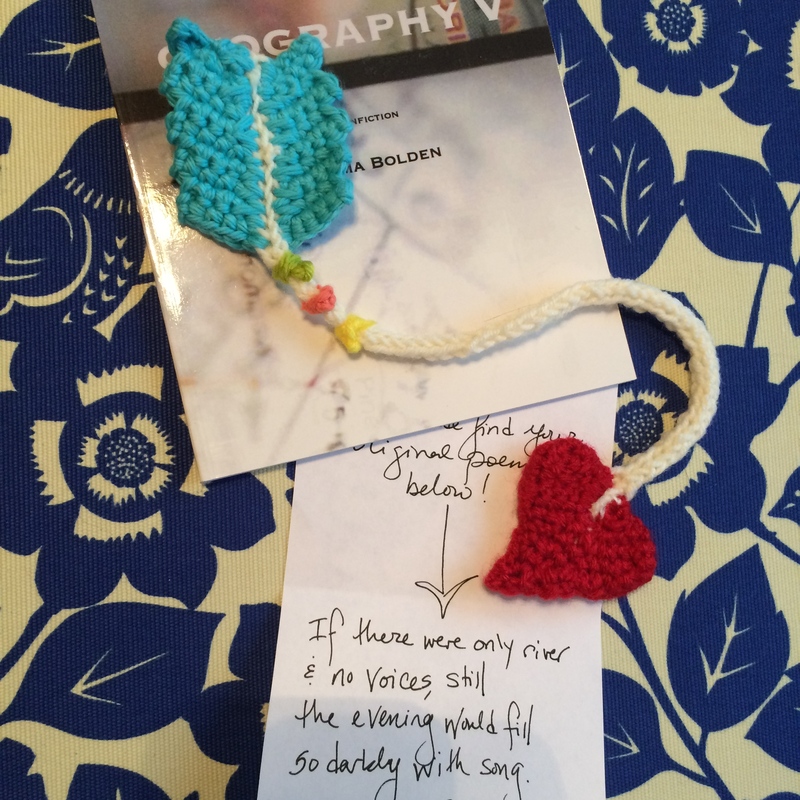 An actual signed (and possibly legibly) copy of Geography V, a sequence of short linked essays about love and lust and distance and maps and computers and glasses and snakes (literal and metaphorical). If you’re interested in learning more about the book and its writing and what the book and its writing meant for me, you can check out my interview with William Kelley Woolfitt at Speaking of Marvels. A post-card featuring the cover image of Geography V (which I totally took with a Pentax K1000 for Hipster Points). Your own original poem written (possibly legibly) by me. A bookmark made out of yarn through the process of crochet. In the photograph, you’ll see the arrow version, but I can also make flower bookmarks, majestic unicorn bookmarks, and Nyan cat bookmarks. I’m selling The Deluxe Edition for $15.00, which can be paid over PayPal or by check. If you’re interested, you can Tweet me at EmmaBo, e-mail me via the form on my homepage (scroll allllll the way down), or comment on this post and we’ll get it sorted. So many options!!! In Arizona, she wrote him, she’d gone to a school called Our Lady of Perpetual Help, nicknamed Our Lady of Perpetual Hell by the bad boys. She’d ridden the bus and sat in the back with them until the day they pushed her face into the seat in front of her and held it there. She tasted hot vinyl. Her teeth cut her lips. Her mother called the school to complain and received a formal apology from the bus driver. I needed to make those boys behave, he’d said, and she’s always so quiet I put her back there. After that, her mother drove her to school every day. Every night, she had the same nightmare: first she was sitting in the passenger seat and her mother was driving, humming a Heart song. Then the dream went black. Then she woke, shrimp-curled in the seat. Her mother wasn’t driving. No one was. She could never remember: was she awake or asleep? On the way home from school her mother would hum and she wouldn’t talk. She wasn’t happy, and though she was only six, she knew enough to know she wanted her mother to know that. Her mother would point out the window to a white square over a line of green that seemed too bright amidst all the brown. Her mother said, look at that. Her mother said, isn’t that funny. She’d look and turn again to the gray ahead of them, the blue that never stopped. Emma, I would love to order Geography V if you still have some!